Why Hasn’t Antonio Margarito Been Banned? During the last ten days or so, we have seen a proliferation of stories and heated discussions about the legendary coach Joe Paterno and what he knew, when he knew it, and how much punishment he should have to take for it. It’s all over my own Facebook page (perhaps ad nauseam) and there is no doubt that you have had heated arguments with SOMEBODY about it. The anti-Paterno argument is that he should not have looked the other way, if that is indeed what happened, when other human beings – in this case, young children – could have been in danger. What could Paterno have prevented? To a different degree – maybe not more, maybe not less – a question about “lack of responsibility” could be asked of anyone who has been around the Antonio Margarito situation in recent years. Who knew he was loading up his gloves, and if anybody was around who could have prevented it, should that not have been done? After all, there is an expectation that is harbored on the part of a fighter about what kind of hurt he could be in for when he steps into the ring. He knows that any punch could hurt him, but he when he signed on the dotted line, he didn’t sign up to get hit with bricks, or anything like it. You could literally kill a guy in there. At the very least, you can scar them up to the point where there is no recovery. The psychological scarring could be just as bad as the emotional scars incurred. You could have asked Billy Collins about it, but that’s not possible anymore. It’s assault with an even deadlier weapon than usual, and for that reason, everyone who knew about it and didn’t step in should be held responsible, as a general rule. Of course, just as John Sandusky is the MOST responsible party in the whole Penn State situation, the MOST responsible party here is the guy who has thrown punches with loaded gloves. That’s why, regardless of eye problems or anything else, I would take a long hard look at licensing Antonio Margarito, under any and all circumstances. I cannot be definite about whether Margarito loaded up the gloves for his first fight with Miguel Cotto. I figure he could have won anyway, but maybe I’m wrong. That “secret weapon” is one of the most powerful one can have inside the ring, and the only case where it would be immaterial is if you couldn’t catch up to the opponent to hit him, as was the case after they headed him off at the pass before Shane Mosley. The point is that it is kind of ridiculous, when you think about it, to let someone fight again, and beyond that to even reward them, after having done something like that, whether you caught him before the act or not. Not only was the guy cheating, but he was doing it to the extent that he showed reckless disregard for the well-being of anyone else. Do you really think that having him sit out a year was punishment enough? What happened to the jail term? I have seen fighters banned for life for much less. I remember a fighter in Miami who got banned for life for taking a swing at a judge who he thought had rendered a bad decision against him. That was justfied, certainly, but it was also something that happened in the heat of the moment. Margarito’s actions, by contrast, were pre-meditated and designed to give himself an advantage in a fight, knowing that there was potential debilitating harm he could do to another. 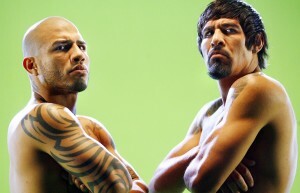 Yet, it is being used as a marketing tool to drum up interest for this Cotto rematch. That may be just the way it is, but it’s wrong just the same. And the only reason I would be writing about someone like that, other than in the vein laid out here, is because I know I don’t make the decisions as to who is suspended and who isn’t, and I know extra care is being taken to ensure he isn’t going to do it again.